Because coefficients of lift and drag for a discus are available from wind tunnel experiments, you can model the flight of a discus where the wind varies. As is well known to throwers, a properly thrown discus will go farther against the wind than with the wind. This Demonstration lets you vary the wind and the two angles controlled by the thrower: the release angle (the angle between the initial velocity and the horizontal) and the inclination angle of the discus. You can set the angles to be the optimal angles for the given wind. Then, using the best angles and varying the wind, you see that a headwind can yield a longer throw than a tailwind. 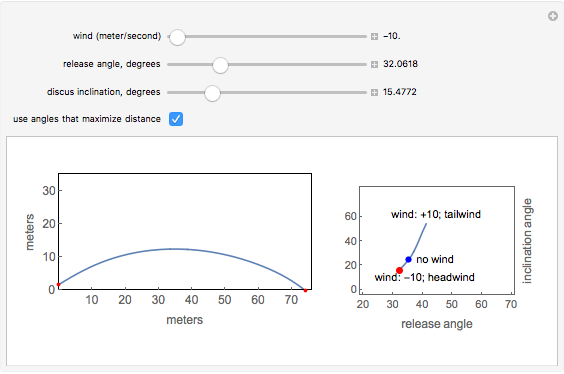 The first snapshot shows an optimally thrown discus with a 10-meter-per-second tailwind; the second is the same with a 10-meter-per-second headwind. The discus goes much farther with the headwind. The last snapshot shows how a large headwind and some strange throwing angles can cause the discus to go backward, a phenomenon that will be familiar to frisbee throwers. More details on the equations needed to model the flight of the discus as well as a reference to the wind tunnel experiments can be found in Chapter 13 of the book by A. Slavik, S. Wagon, and D. Schwalbe, VisualDSolve, 2nd ed.